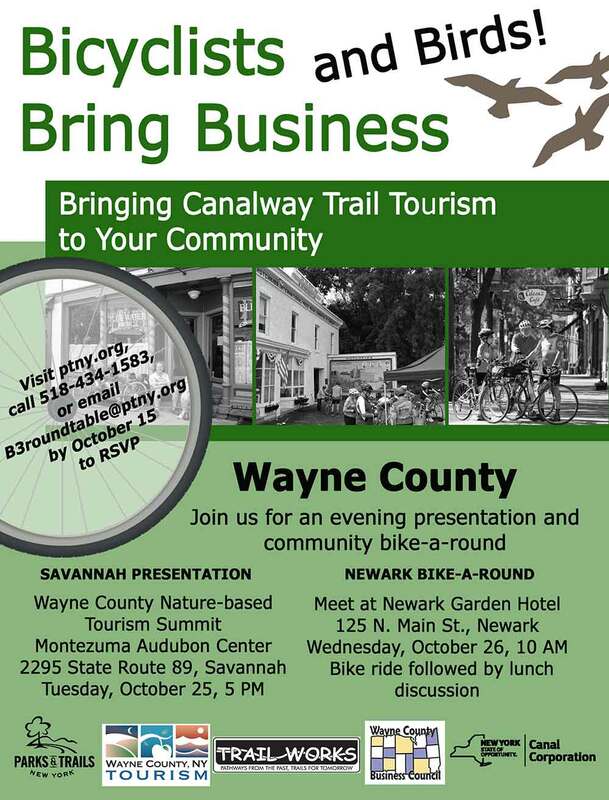 PTNY and the NYS Canal Corporation hit the road in October, bringing Bicyclists Bring Business events to the Wayne County communities of Savannah and Newark. For the first time in 2016, the evening portion of Bicyclists Bring Business was offered as part of a larger program, a Nature-based Tourism Summit at the Montezuma Audubon Center in Savannah. Since the Canal Corridor offers such a range of recreational and cultural opportunities, it made sense to compliment the bikes bring business message and tips with presentations on birding, hunting, and fishing and the economic opportunities they present. The Montezuma Audubon Center was a great venue for this collaboration as the Montezuma complex boasts a range of recreational opportunities, including birding, boating, and hunting. A presentation from Montezuma’s Executive Director Chris Lajewski hinted at future cycling routes through the complex. 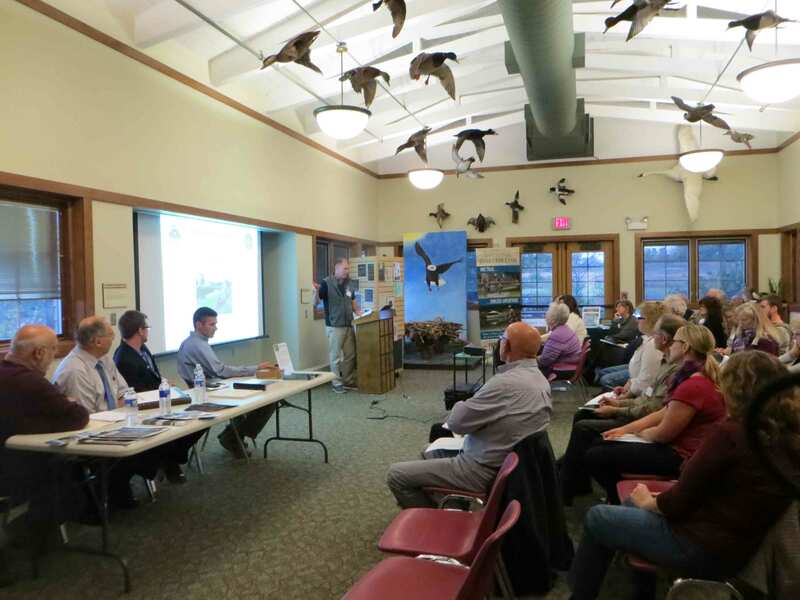 Attendees came from across central and western New York, and included a mix of cyclists, birders, business owners, and representatives from local governments, Wayne County and relevant state agencies. PTNY’s presentation, sprinkled heavily with cycling terminology and jargon, provided some background on cycling tourists, and the economic impact of the Erie Canalway Trail. Then all in attendance were asked to participate in a conceptual group ride to two of North America’s most developed trail systems, the Great Allegheny Passage and L’Petit Train du Nord. A quick spin through best practices for attracting and catering to cycling tourist followed. Canal Corporation led the warm down phase of the cycling portion of the program, previewing the Canal Bicentennial celebration and the 2017 World Canals Conference. Of course, progress in Closing the Gaps in the Canalway Trail was a topic of discussion. Eastern Wayne County is home to one of the largest remaining gap sections. Ora Rothfus from Wayne County Planning & Economic Development walked those assembled through the trail alignment, both existing and proposed, as it moves through the County. Ora’s presentation showed that while there is much work to be done, Wayne County does not lack for stakeholder involvement or opportunities for trail connections. Jim Eckler from NYS Department of Environmental Conservation, and Chris Kenyon from Wayne County tourism provided data and anecdotes about the significant impact that hunting and fishing have for local economies in Wayne County. Wednesday’s chilly weather failed to put the brakes on the second component of Bicyclists Bring Business, the community Bike-a-Round. This year’s parcours was Newark, the largest city in Wayne County. A group of 10 riders spent about two hours on the trail and in the Village of Newark, looking for ways in which the community could better publicize existing amenities, attractions, and services as well as suggesting additional steps that would better serve trail tourists. Mark Peake from the Village of Newark provided motorized SAG (Support and Guidance), meeting cyclists at many of the pre-determined discussion locations to point out steps Newark has taken and to listen to ideas from the group. After observing, discussing, and enjoying Newark, participants gathered for a lunch discussion and debrief at Parker’s Grille & Tap House. Thanks, and let’s keep talking! Wayne County proved a great venue for this year’s B3 events. With the County recently completing new trail sections, and a working group meeting to close the remaining gaps, it was the right time to get together to discuss opportunities that a completed trail will bring, as well as the connections between the various recreational pursuits that bring visitors to Wayne County. With feedback from participants from both events, PTNY is currently preparing a summary report and recommendations for next steps. Special thanks is in order for Chris Lajewski of the Montezuma Audubon Center for hosting the event, Ron Palladino from the Wayne County Business Council for organizing a great program, and Glenn Wallis from Trail Works for planning our Newark Bike-a-Round! We’d also like to thank Wayne County Tourism, Wayne County Planning & Economic Development, New York State Department of Environmental Conservation, the Village of Newark, Wayne County Cornell Cooperative Extension, and SOAR (Strengthening Our Area Residents). As always, the New York State Canal Corporation makes Bicyclists Bring Business possible.